An important port for centuries, La Rochelle is a vibrant city with a lot of history and important transportation links to all the Poitou-Charentes region, and the rest of France. The city has always been an important commercial port, trading with England, the Netherlands, Spain and the New World. La Rochelle's medieval Vieux Port at the city center, guarded by two ancient towers, is well preserved, with many seafood restaurants ranged around it. 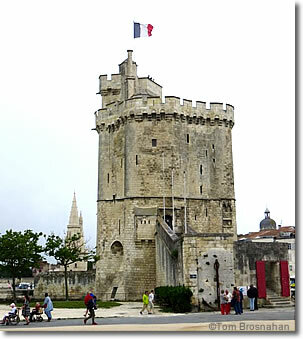 As befits a city by the sea, La Rochelle also has the fine Aquarium La Rochelle just a short stroll from the Vieux Port. Gallic tribes and the Romans were here before the founding of the town in the 900s CE. Eleanor of Aquitaine married King Henry II of England, bringing La Rochelle into the domains of the Plantagenets. Control of the city changed hands, French to English, several times. of the harbor in La Rochelle.